Global Carotenoids Market Projected to Surpass $2 Billion by 2024, See Which Product Types and How their Applications Contribute the Growth – Market Report (2017-2024) by Industry Experts, Inc.
Industry Experts, Inc. published the new market research report “Global Carotenoids Market – Products and Applications“. Visionary analysts at Industry Experts reveal that the dietary supplements sector will lead growth of the market for Carotenoids consumption globally and market likely to touch US$2.2 billion by 2024. Animal feed and food & beverage sectors are currently the largest markets for carotenoids globally. Carotenoids are used on a large scale in animal feeds, which is acting as the key growth driver of this market due to their high nutritive value and the pigmentation, which increases the palatability of the feed, in addition to enhancing the appearance of meat, meat products and fish. Growing awareness among consumers about benefits of carotenoids, greater emphasis on a healthy lifestyle and rising incidences of various diseases across the globe is driving the demand for carotenoids in dietary supplements and cosmetic industries. Global demand for carotenoids by product is led by astaxanthin, estimated to account for about 32% in 2017, which is further projected to reach US$772 million by 2024. Carotenoids worldwide market is anticipated to touch US$1.5 billion in 2018. The report reviews, analyses and projects the Carotenoids market for global and the regional markets including the North America, Europe, Asia-Pacific and Rest of World for the period 2015-2024 in terms of value in USD. These regional markets further analyzed for 13 independent countries across North America – The United States, Canada and Mexico; Europe – Germany, France, Italy, Spain and The United Kingdom; Asia-Pacific – Australia, China, India, Japan and South Korea. Carotenoid types analyzed in this study include Astaxanthin, Canthaxanthin, Beta-Carotene, Lutein, Lycopene, Annatto and Others. The study also explores the applications markets for carotenoids covering Food & Beverages, Cosmetics, Dietary Supplements, Animal Feed and Pharmaceuticals. 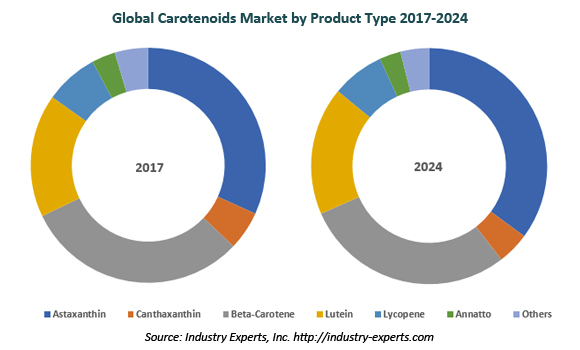 This 344 page global carotenoids market report includes 197 charts (includes a data table and graphical representation for each table), supported with a meaningful and easy to understand graphical presentation, of the market. The statistical tables represent the data for the global market by geographic region, product type and major application. This report profiles 19 key global players and 55 major players across the North America – 15; Europe – 8; Asia-Pacific – 26; and Rest of World – 6. The report also provides the listing of the companies engaged in research & development, manufacturing and supply of carotenoids. The global list of companies covers addresses, contact numbers and the website addresses of 306 companies.